We had some pretty strong feelings about some aspects of the entry to our Wizarding World. I collected tons of ideas for creating a Platform 9 3/4 entryway in hopes that I would find a shortcut for creating the effect I wanted. In the end, I stuck with the painted brick curtain that served as the entry to the Hogwarts Express Platform. Most of the examples we found online had the Platform Sign posted above the curtain, but in my mind this is a huge "no no!" Platform 9 3/4 isn't ever visible to muggles, so we didn't want to post the sign outside. Instead, I printed simple signs for Platform 9 and Platform 10 similar to the ones visible in the movies. We posted those on each side of the door with the curtain. I'm just keeping it real here because when I looked at this photo, I realized just how badly our house needs to be power washed. So, here I am sharing photos of the green-covered bricks by our back door with everyone on the internet. Life's too short to worry about what you might think about my moldy bricks. There's a reason I'm not a home blogger! The curtain would have been more impressive at our front door, but nobody ever comes to our front door. In the end, I am so glad I took the time to paint the bricks on the curtain. 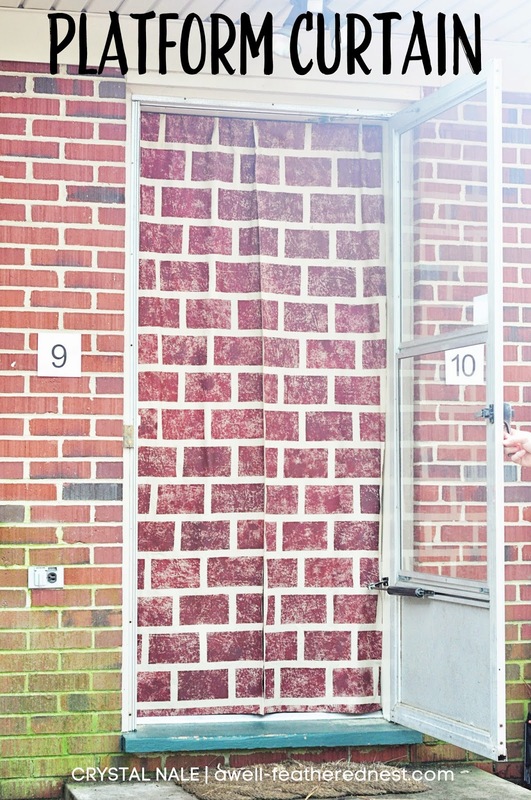 It blended in with the real brick so much better than anything else ever would have. Because I put it off to the last minute and my goal was to keep from spending an insane amount of money on the party, I used items from around the house. I even got lucky because our neighbors put a tension rod out by the street for the garbage the same day I was painting the curtain! I used a beige twin sheet that I already had. Some tutorials I came across used sponge-stamped bricks and a couple used taped lines and spray paint. I didn't have a rectangular sponge, and I decided it would be less stressful for me to try to keep tape straight and properly spaced than to risk messing up with a sponge stamp. I used some frog tape from our painting box, and I actually used a tape measure to try to get the tape lines pretty even and straight. It would have been faster to use spray paint, but I mixed together acrylic paints that I already had to get a good brick color. This ended up working well because I could tweak it a tad to get some varied color in the bricks. I used a kitchen sponge to daub the paint on over the taped lines. I put down a drop cloth inside, and laid the sheet on top of that to paint it right in my living room. It took me four (yes, four) hours to finish taping and painting the curtain. Thankfully, we were able to listen to part of the Goblet of Fire on audio while I worked. That helped to keep the crazy almost-six-year-old occupied. It took FOR-EV-ER, but I loved how it turned out. The colors were perfect. I learned that red, a LITTLE bit of green and some yellow mixed together will get you a pretty good brick color. I made some general measurements before I started taping to know how much of the sheet needed to be covered, and I cut the sheet after the paint had dried. The tension rod fit neatly into the seam at the top edge of the sheet once I trimmed the sheet and cut it down the middle, and I just left the edges raw. It was difficult to get a good photo of the entryway because it's so small. I designed a Hogwarts Express Platform sign that I printed onto card stock, pieced together, and posted on the wall opposite the back door. I also used my favorite kraft builder's paper and string from the Dollar Tree to wrap some boxes to decorate the platform. A borrowed lantern, Hedwig, and Trevor welcomed everyone to the Wizarding World! There are lost of Hogwarts banners for sale online, but I really didn't want to spend that much money on just one decoration for the party. I knew I would need a lot of little items to help create an atmosphere with decorations, so I came up with a plan to save some pennies for other things. I bought a 1/2 inch dowel, round ends that fit the dowel, a sheet of stiff, black felt, and some gold acrylic paint. All of these supplies were maybe $7 - $8 with a coupon. To make the banner, I printed the Hogwarts crest onto white card stock, and cut closely around the edges. I measured and cut the dowel to a good width. The cut didn't have to be perfect because the ball ends covered that up. I hot glued the round ends to the dowel and painted it all gold. I measured and cut a triangle out of the short edge of the felt to make the pennant shape, and I hot glued the crest onto the center. I hot glued the top of the banner to the middle of the dowel, and I used plain old string to hang it over the doorway. It served its purpose, and now it's hanging in my kids' room--all for a couple of bucks and some time well-spent. 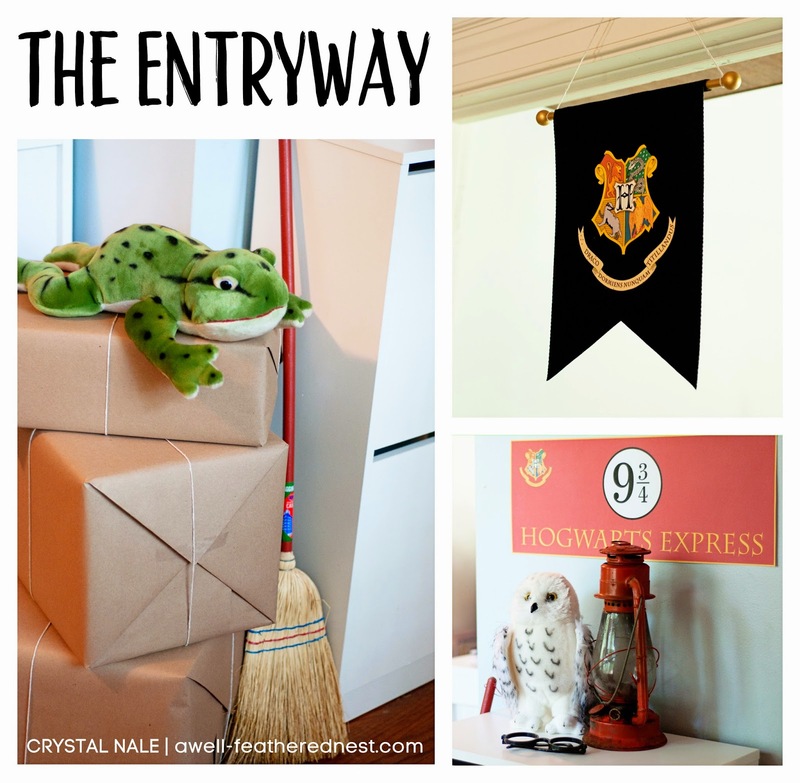 Be sure you check out the Overview Post for links to other Harry Potter party ideas! Thanks so much for sharing the Hogwarts Express sign! It's perfect!